Following the study plan for SBI PO Preliminary Examination 2018, the fourth week starts with practice questions on Miscellaneous Questions Set. To ensure proper preparation of the section we advise you to go through all the questions sincerely and try to attempt each one of them. Afterward, match your solutions and the approach with the one that would be provided later. Practice more and more questions on the same section to enhance your grip over the topics. 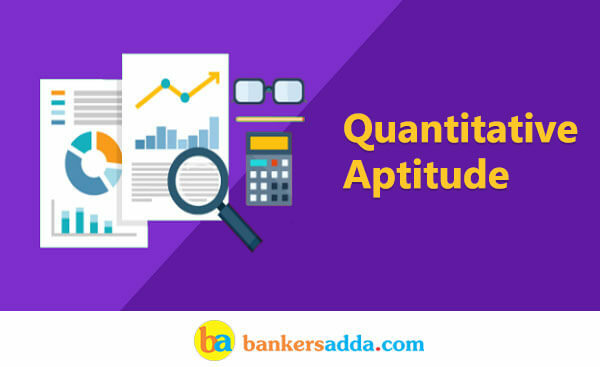 Following is the Quantitative Aptitude quiz to help you practice with the best of latest pattern questions. Directions (1-5): the given line graph shows the number of candidates who qualified IIT exam from Aakash and FIIT JEE in 5 years. Q1. If number of candidates who appeared for IIT JEE from FIIT JEE in 2015 is 20% more than candidates appeared in 2014 from FIIT JEE. And 0.6% candidates out of total appeared candidates from FIIT JEE qualified for IIT in 2014. Find the qualifying percentage from FIIT JEE in 2015. Q2. Candidates qualified from Aakash in 2012 and 2016 together are how much percent less than candidates qualified from FIIT JEE in 2013 and 2014 together. Q3. If female candidates qualified from Aakash in 2012 and 2016 are 20% and 40% less respectively than male candidates in the same years respectively then find the ratio of male candidates to female candidate qualified from Aakash in 2012 and 2016 together. Q4. Find the difference of average number of students from FIIT JEE in 2012, 2014, 2015 together and average number of students from Aakash in 2012, 2014, 2016 together. Q5. If every year 40% of qualified candidate from FIIT JEE and 60% of qualified candidate from Aakash are female, then find the male candidate qualified from FIIT JEE in 2015 and male candidates qualified from Aakash in 2013 together. Directions (6-10): Find the value of ‘x’ in the given simplification problem. Directions (11-15): Study the table and answer the questions that follows. The given table shows the no. of branches of Axis bank in 5 different City, total no. of employee in that city and the respective ratio of male to female employees in city. Q12. Average no. of female employee working in each branch of Nagpur are how much percent more or less than average no. of female employee working in each branch of Surat. Q13. Find total no. of female employee working in these 5 cities. Q14. If 30% employee from Delhi are post graduate and ratio of male to female post graduate employee in Delhi is 5 : 3. Then find the difference of non-post graduate male employee and non-post graduate female employee in Delhi . Q15. If 33 male employees and 15 female employee retires from Nagpur zone, then in remaining employee male employees are how much percent of female employee.